Just like the old-fashioned brownies your Grandma made, this cake is soft, not overly sweet, and full of delicious chocolate flavor. Top with the chocolate ganache frosting to amp up your favorite brownie flavor! 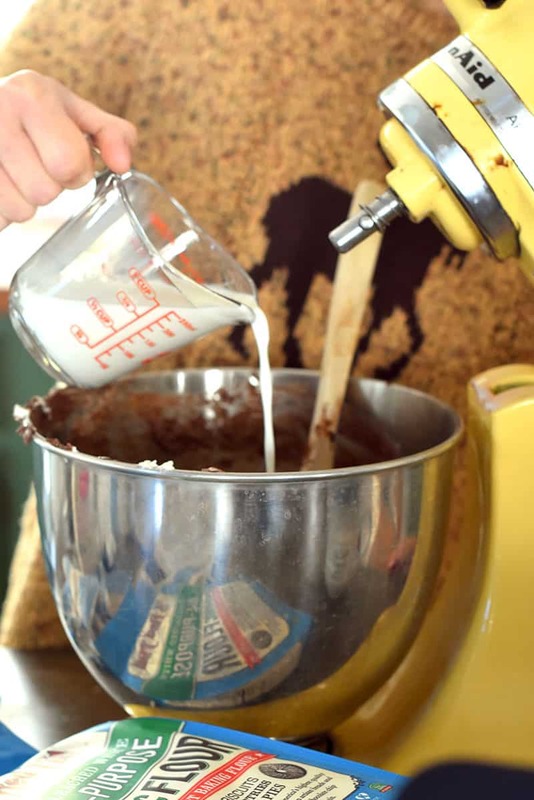 This Brownie Cake Recipe is sponsored by our favorite ingredient brand, Bob’s Red Mill. 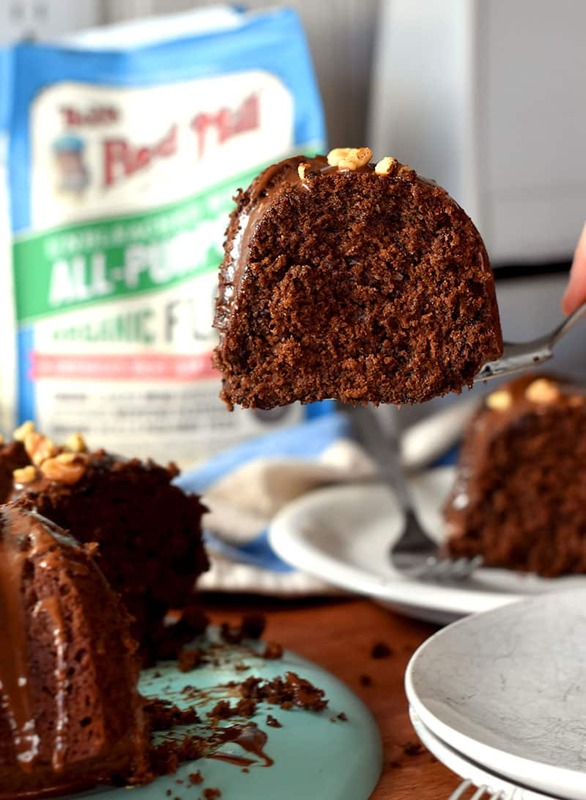 Great homemade cake recipes require great ingredients and Bob’s Red Mill is the best! Just like your favorite cake-y old-fashioned brownies, this brownie cake isn’t too sweet or fudgy. 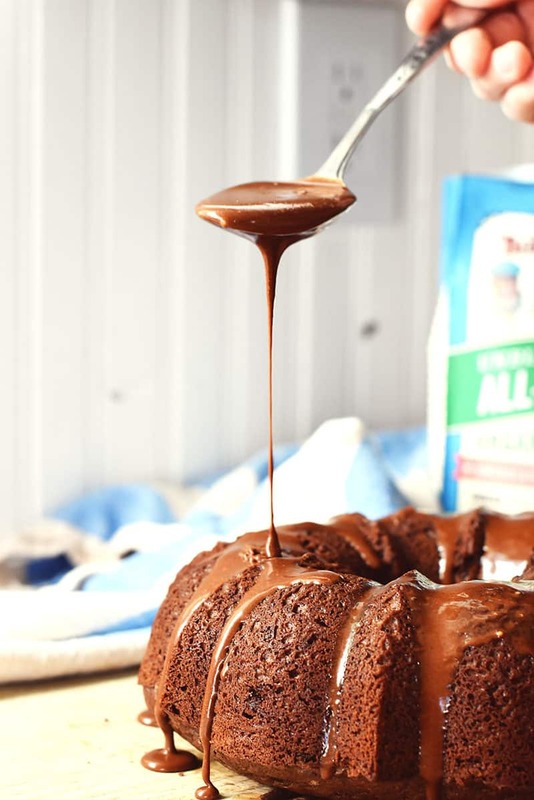 All the flavor of your old-fashioned brownie in bundt cake form. 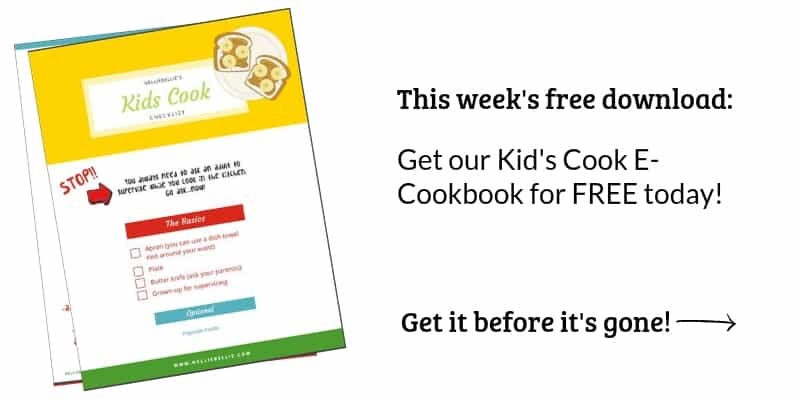 Perfect for serving up for weekends! 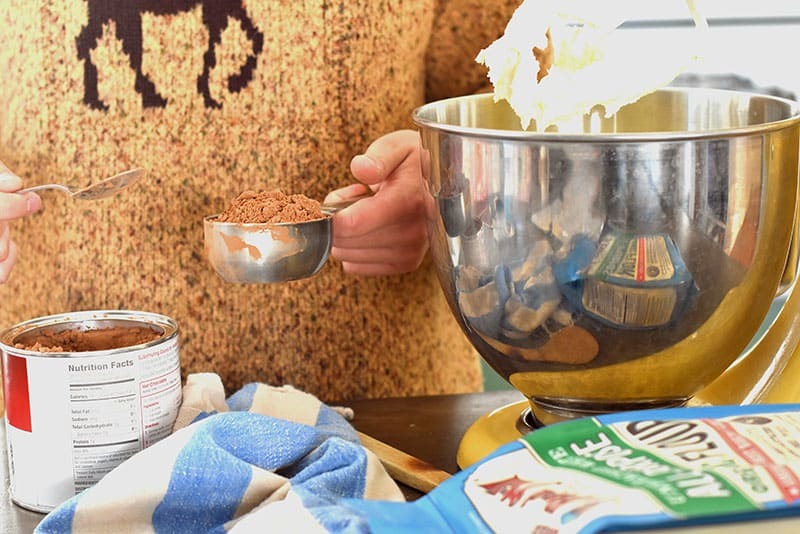 Don’t skip the chocolate icing for the perfect brownie flavor! What is a Brownie Cake? Honestly, there really isn’t any such thing as a true Brownie Cake. I KNOW, that makes me sound like a liar or trickery person (is that even a word :)). Here’s the thing, brownies don’t have leavening agents (to help them rise) in them. Cake does. Brownies are gooey on the inside and a bit crisp on the outside while cake is spongey on the inside and soft on the outside. So why then do I call this a brownie cake? Because I use my Grandmas old-fashioned brownie recipe and added leavening agents and a bit more flour. Then covered the whole thing in gooey chocolate frosting. It tastes just like the old-fashioned brownies but has the texture of a cake. Brownie Cake. See, totally didn’t lie to you. By the way, chocolate brownies are a relatively new thing (probably the 1900’s) and thought to have originated in the US. Most of our grandparents didn’t grow up on the fudgy brownies we know today. In fact, my grandparents dislike them and think they are far too sweet. Brownies, actually, are usually classified as a bar. Although we totally put them in their own category, don’t we :). And after supper, I have a whole stomach dedicated just to brownies. Anyways, the point is that this cake isn’t like our modern brownies. It isn’t fudgy and sweet. It is, in fact, more like the early old-fashioned brownies with a subtle chocolate flavor, not overly sweet, and not nearly as rich as our brownies today. Just good ingredients with a touch of sweet. 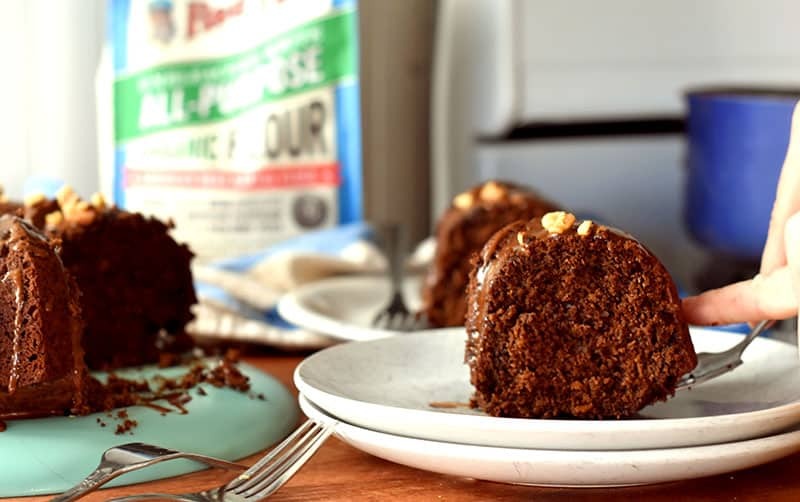 Pair up this brownie cake with the yummy chocolate frosting and a sprinkle of nuts to get that richer, gooey brownie flavor that you might be more accustomed to. And, for Pete’s sake, invite your grandparents over to enjoy it with you!! Although this brownie cake uses cocoa, I also add melted chocolate to amp up the flavor and help provide needed moisture. You can use low-fat milk, if you prefer, but I would highly recommend using the whole milk or even half and half. The texture of the brownie cake will be far better! My Grandma always used full-fat in everything she baked and swore it made things better. I totally agree! 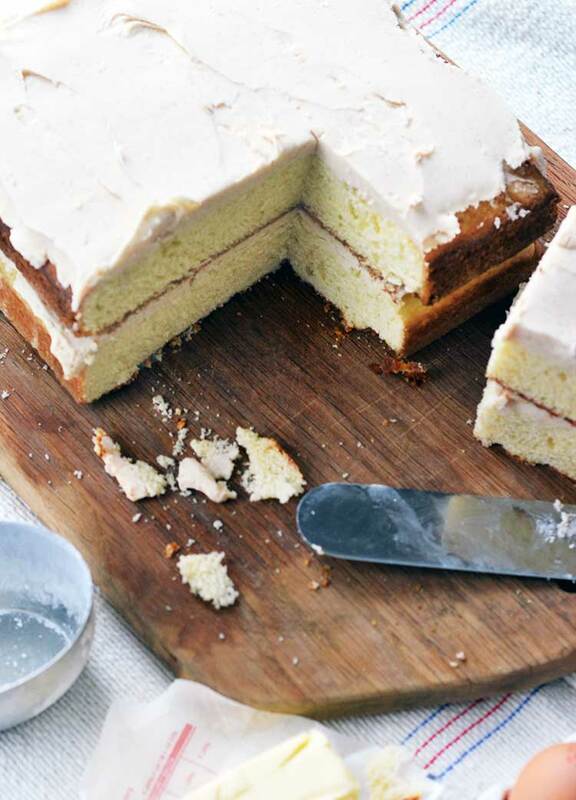 And, it is such a simple trick for great tasting bakes! 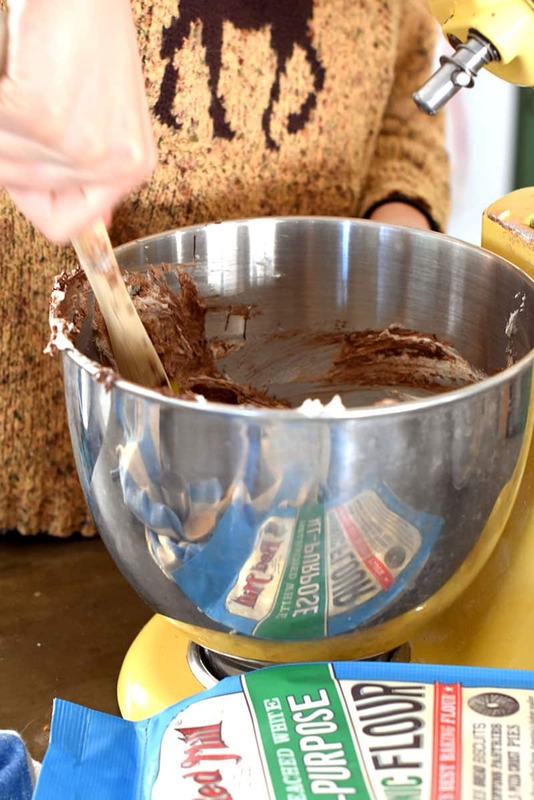 Although I cream the butter and sugar with my stand mixer, add the eggs one at a time, and then the cocoa, but I use a wooden spoon to add the melted chocolate and finish up the recipe. I want to be as gentle as possible and keep as much of that air in the batter as I can. 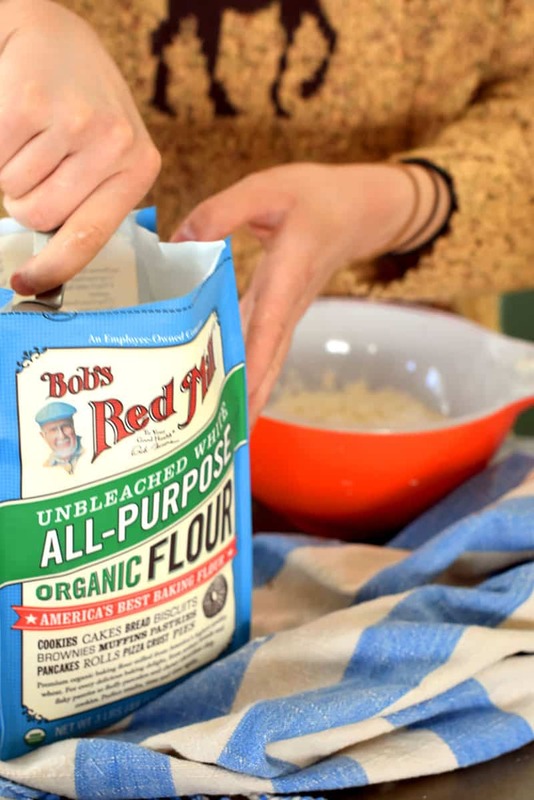 Add your Bob’s Red Mill Organic All-Purpose flour in a little at a time, gently folding the flour into the batter and not overworking it. I had to do it. A bundt cake is my ultimate Grandma cake. Whenever I am in an antique store I’m eyeing up the antique bundt pans. I adore them. Seriously have a problem. In fact, it just dawned on me as I write this that I should have a bundt pan wall in my kitchen. Holler!! Not joking, I’m totally starting a wall. And I hope my hubby doesn’t read this ;). 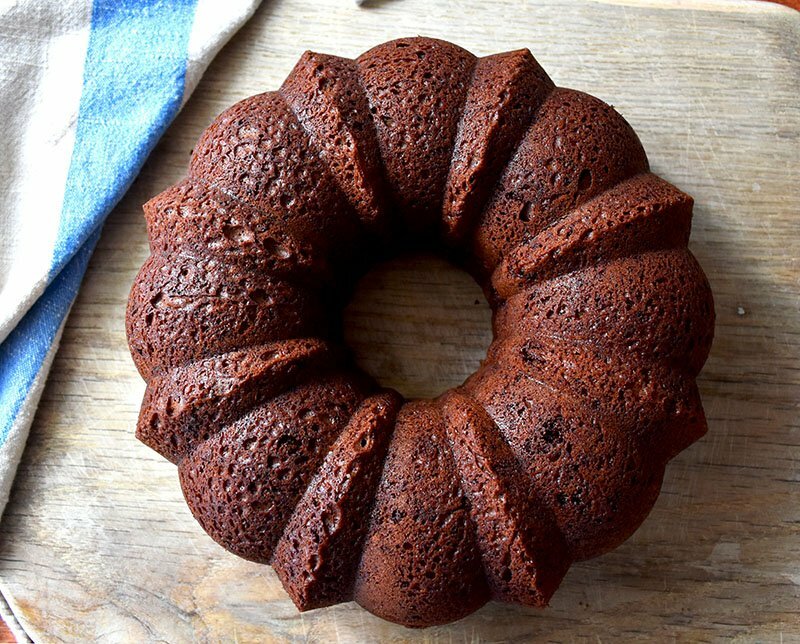 You don’t have to use a bundt pan, if you don’t have one or aren’t obsessed with them like me. I would go with a 9 by 13 inch for about 25 minutes and check it. It will probably need a total of about 35. When do I know my cake is done? 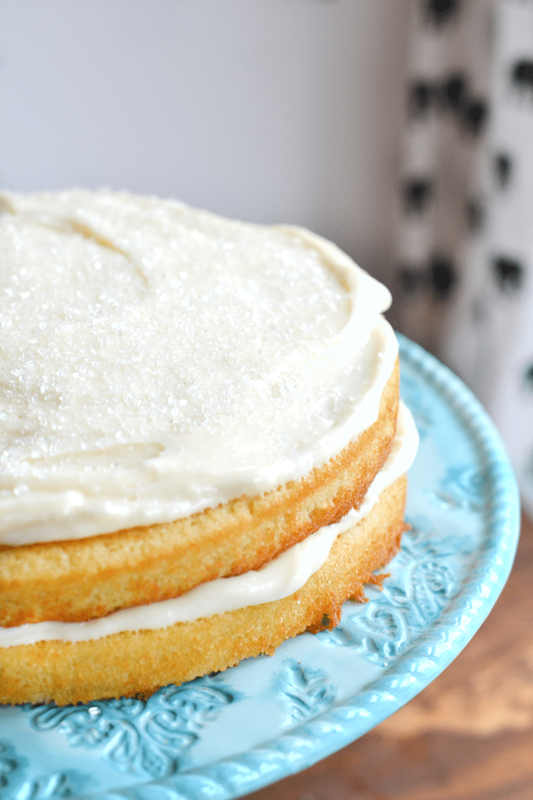 Don’t let this cake over-cook, it will dry out quickly! When you see the cake pulling away from the pan around the edges and starting to look dry on top…check it. Insert a toothpick or knife and if it comes out clean, it’s done. 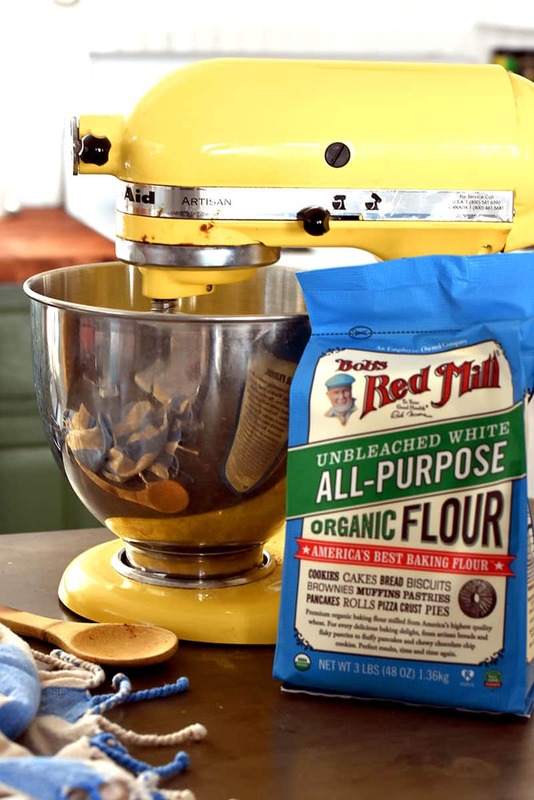 1 1/2 cup flour Bob's Red Mill Organic All-Purpose is the best! Add cocoa, oil, & melted chocolate. Stir gently. Add vanilla and milk stirring gently, but well. Stir in flour, baking powder, & soda just until mixed. 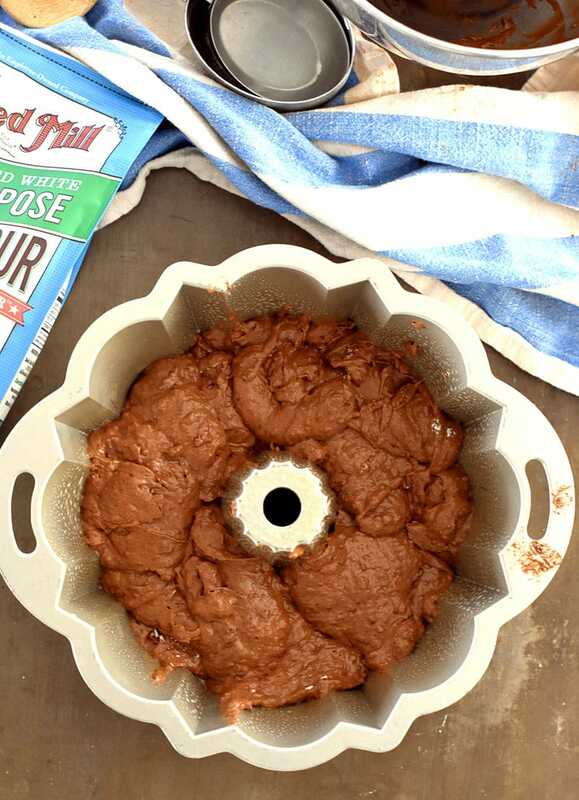 Pour batter into greased bundt pan or 9 by 13 pan. Bake for 25 minutes for 9 by 13 and then check, 35 minutes for bundt pan and then check. You will probably end up at 35 for a 9 by 13 and 45 for the bundt pan. 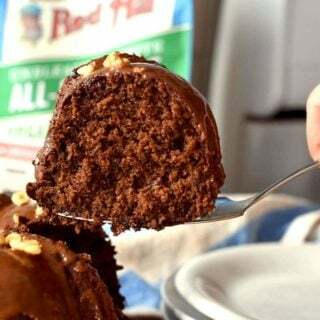 If using the bundt pan, let cool for about 5 minutes before turning out on to a cooling rack and allow to cool completely before adding the chocolate frosting. In a small saucepan, warm cream and butter together. When melted, add chocolate chips and coffee. Stir well. Add the salt and about half the powdered sugar. Whisk well. Continue adding powdered sugar until desired consistency is met. Spoon over cooled cake. Top with chopped walnuts, if desired. 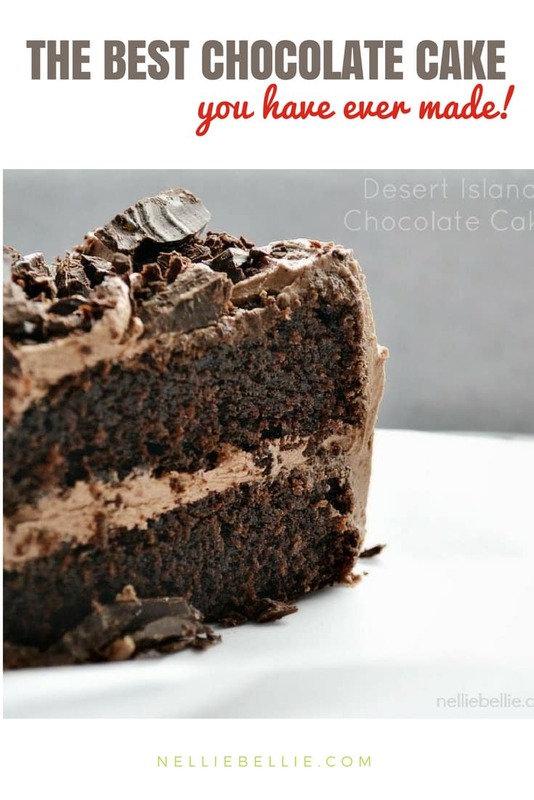 Seriously, the BEST Chocolate Cake!